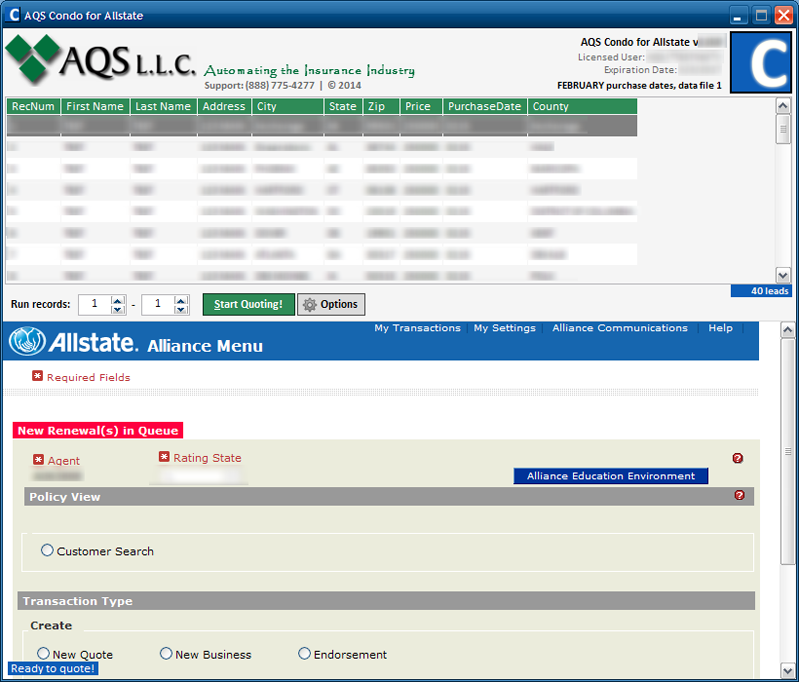 AQS Condo for Allstate software is provided to you on a month-to-month basis; no commitment. The software can be installed on multiple computers and can be used by anyone at your agency, simply and effectively. AQS provides FREE tech support and FREE software updates for the term of your license. Log in, select the records you would like to run, QUOTE. It's that easy! AQS Condo leads are exclusive to your agency! Our leads are provided to you by county on a month-to-month basis; no commitment! Each condo lead will contain: name and address of the condominium owner and the purchase price and purchase date of the property. Our data is accurate and sourced directly from County Deeds Offices. All data is NCOA-scrubbed and CASS-certified to ensure deliverability and to qualify your mailings for bulk rate. It is the agent's responsibility to follow Allstate's scrubbing and DNC guidelines.